Can sine wave break PA speaker? Whether it its a sine wave or not is almost irrelevant. I say almost, as if you do hit a resonant frequency you could destroy something else in the room - theoretically... you would need power to do this though. You did not destroy your laptop speakers because you played a sine wave. You may have destroyed them because the volume was too high or there was a fault. In reality, you are less likely to damage a speaker using a sine wave as you will have less rapid transitions than a sound of the same frequency with harmonics and other higher frequencies. 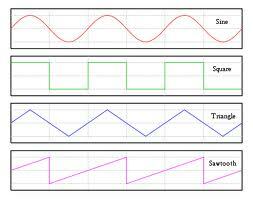 A sine wave is actually the most gentle of movements for a speaker. Have a look at this image from wikipedia. For a speaker to follow a sine wave - the top waveform - it just moves in and out with the sine wave, but to try and match the square wave - the second waveform - it has to move incredibly fast at each of those vertical transitions. This requires a lot of power in high frequencies and can very easily burn out a speaker coil, or destroy the physical cone if the speaker is not rated for those frequencies. As for your question regarding playing in the church, it is all about the volume. A sine wave puts out energy at just one frequency. If your intent is letting a bass speaker go up in flames before a tweeter does, a sine addressing just the bass speaker is the right tool. A rectangular wave of the same amplitude, however, contains just the same amount of energy at the fundamental frequency. So with a single speaker, it's at least as capable of blowing out the speaker. The reason it doesn't do that is that you won't play it for 10 seconds since it hurts, cranking out ugly noise at frequencies your hearing is sensitive at. In contrast, if you play a low frequency sine at large volume over laptop speakers, it sounds comparatively benign. Particularly if you play it at frequencies where laptop speakers don't even manage to convert it into acoustical energy because they are too small. The largest killer for large speakers is DC which is the lowest in frequency you can have, transfers no acoustic energy at all and heats the speaker coil without any venting by movement. Now laptop speakers don't have much of a venting effect anyway, so DC and low frequencies are similarly harmful, and when you work them at frequencies it does not significantly convey to your hearing, it will be similarly unnoticeable. The laptop circuitry actually tends to provide protection from DC (via decoupling RC parts) but not so from low frequencies ostensibly in hearing range. So I'm pretty sure you could have taken out your speakers using rectangular waves equally well or better. It's just that you would have stopped before they blew out because you would have heard that you were doing something stupid. Sine waves are not more cruel than rectangular waves of comparable amplitude or other stuff, they are just stealthier, particularly at low frequencies. If it's a consolation to you, rectangular waves excel at taking out tweeters in multi-way speakers even when their fundamental is still in the range of a bass speaker. But for single-way speakers (or if you target specific speakers of a multi-way setup), sine is the way to focus your energy. How can I test a speaker circuit's impedance? Do new speakers require a “break-in” period? Is there a digital speaker?